There are 2 types of people, tree planters, and tree murderers. No. Not really. Sometimes people who plant trees also kill them. Me, for example. 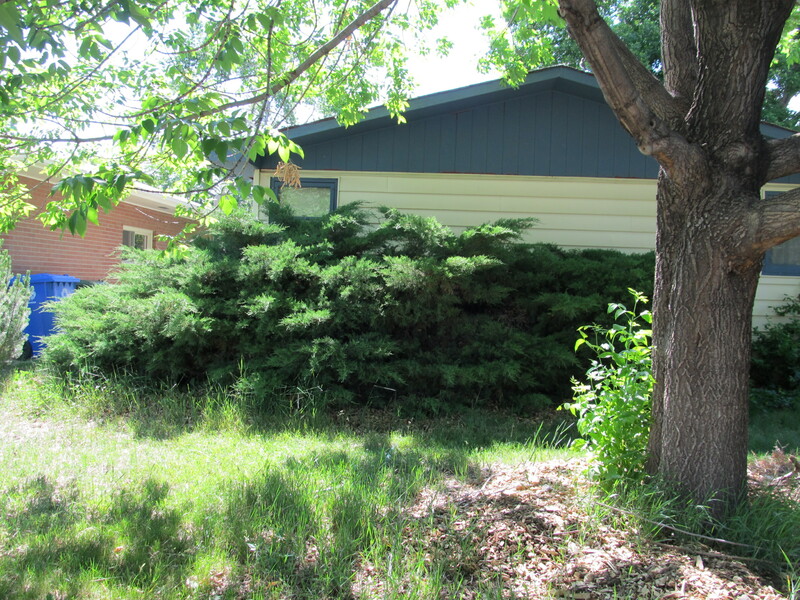 We have juniper bushes that were probably planted when the house was built, almost 50 years ago.They are hideous and over-mature- we have trimmed them in past years, but not the past couple of years. They half block the windows, making the front bedroom cavelike all year round. They have to go. What has been holding me back? Does anyone know how to figure out the R value of 50 year-old juniper bushes? Me neither. Actually, there are places on the web where you can figure it out, but as far as I have been able to determine, the most value comes from bushes stopping the wind in winter. These uglies are on the east side of the house, and winter wind hits us from the north. I am not convinced they make much difference in gas bills in the winter. They do make a comfort difference in summer, I suspect, since, as I said, they make the front bedroom cave-like. Snake habitat- animal habitat in general, actually. Dense, prickly bushes make great protective homes for wildlife, not just the cute cuddly birds and butterflies that people want to attract, but also the garter snakes and rodents who are part of the environment but who don’t get the kind of press that butterflies do. By taking out shrubs that are close to 7 feet tall and 4 feet wide, I am affecting beings other than myself. I’m doing it anyway. I’ll let you know how it goes.